Amsterdam, NL – While human genetic mutations are involved in a small number of Parkinson’s disease (PD) cases, the vast majority of cases are of unknown environmental causes, prompting enormous interest in identifying environmental risk factors involved. The link between Helicobacter pylori (H. pylori) and gastric ulcers has been known for several decades, but new evidence suggests that this harmful bacterium may play a role in PD as well. 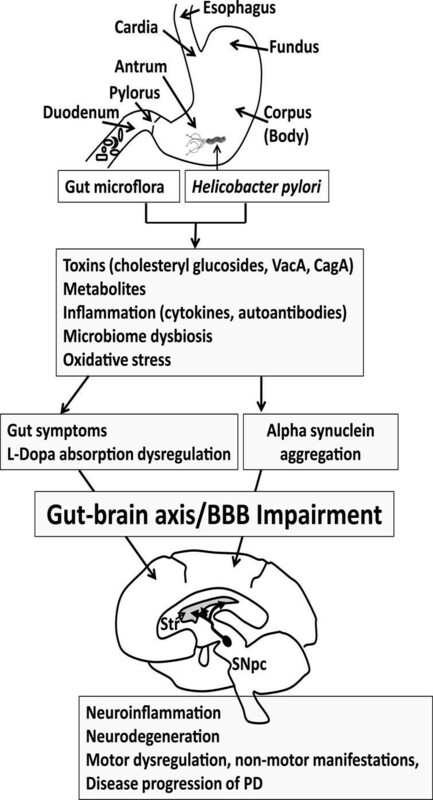 A new open access review in the Journal of Parkinson’s Disease summarizes the current literature regarding the link between H. pylori and PD and explores the possible mechanisms behind the association. The bacteria might interfere with the absorption properties of levodopa, the medication commonly used to treat the symptoms of Parkinson’s disease. The onset of PD is often preceded by gastrointestinal dysfunction, suggesting that the condition might originate in the gut and spread to the brain along the brain–gut axis. In the review, investigators note that this has been documented in rats. 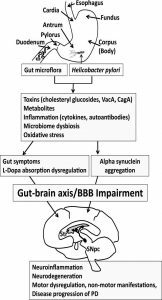 Full open access study: “Stomaching the Possibility of a Pathogenic Role for Helicobacter pylori in Parkinson’s Disease,” by David J. McGee, Xiao-Hong Lu and Elizabeth A. Disbrow (DOI 10.3233/JPD-181327) published in the Journal of Parkinson’s Disease, Volume 8, Issue 3 (August 2018) by IOS Press. It is available open access at: https://content.iospress.com/articles/journal-of-parkinsons-disease/jpd181327. For additional information, contact Diana Murray, IOS Press (+1 718 640-5678; d.murray@iospress.com). Journalists wishing to interview the study’s authors should contact Dr. David McGee, LSU Health Sciences Center-Shreveport (+1 318-675-8138; dmcgee@lsuhsc.edu).